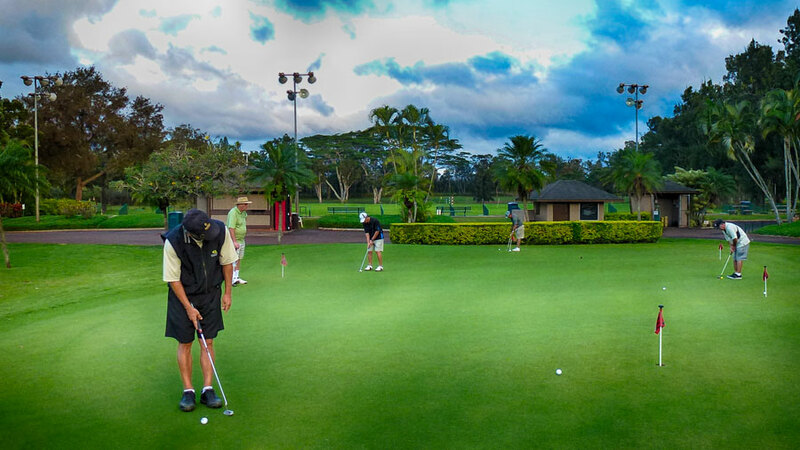 Planning on Golfing in Hawaii? If you’re thinking about golfing in Hawaii, you’re in luck. This is because the Hawaiian Islands has some spectacularly beautiful courses that are open to the public. And this is particularly true on the neighbor islands of Maui, Kauai and the Big Island of Hawaii. Maui has the Kapalua Plantation Course and hosts a PGA Tour stop every year in January. The Big Island has Hualalai, which is home to an annual PGA Champions Tour stop. Kauai has the venerable Princeville golf complex which offers breathtaking cliff-side views of the Pacific ocean and the mountains. Other noteworthy course are Wailea and Ka’anapali on Maui as well as Waikaloa, Mauna Kea and Mauna Lani on the Big Island. Of course, the island of Oahu has great courses too. Oahu has Ko’olina which now hosts a new LPGA tournament. Oahu also hosts the Sony Open, which is a PGA Tour stop each year. But the PGA stages the event at the Waialae Country Club, which is a private, members-only course. Other popular public courses on Oahu include Kapolei, Makaha West and Turtle Bay. However, you’ll pay a premium for the privilege on playing on some of these challenging courses. Most will be in the $100 range unless you are a local resident. Locals typically enjoy a “kama’aina” rate, which is significantly less than what non-locals pay. If you are in the Waikiki area, you can clearly see a municipal golf course facility across the Ala Wai Canal. This would be the Ala Wai golf course, a local favorite. But if you’re a tourist, you should think twice about playing here. Not because it’s expensive; but because it’s too hard to get on to. Ala Wai is reputed to be the busiest golf course in the world. So your time is probably better spend looking at playing at some of the other resort courses on Oahu. So if you’re planning on golfing in Hawaii, check out the many discounted Hawaii vacation packages that Panda Travel ® has to offer on its website. Fore!